AnyMP4 iPhone Transfer for Mac is a professional software designed for iPhone users. It can export movies, music, Camera Roll, etc. from iPhone to Mac and add local files to iPhone. And it supports the iOS 5.1.
some powerful editing functions to help you customize the video according to your need. 4Easysoft Video to PMP Converter, as professional PMP Converter, is specially designed for anyone who wants to enjoy movies on the Portable Media Player. 4Easysoft Video to PMP Converter accepts a wide range of video formats and output formats. 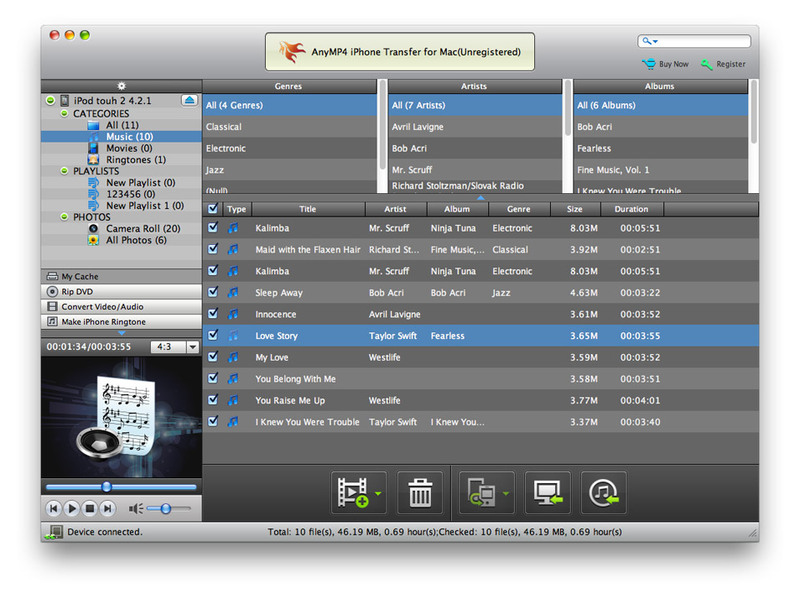 AnyMP4 iPod Transfer for Mac is the professional iPod transferring software, which can help iPod users backup iPod files like music, movie, ringtone, pictures, Camera Roll, etc. Also, it can import video, audio, etc. files to iPod.